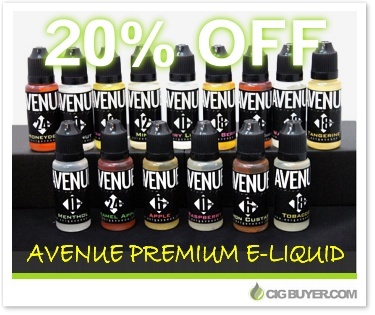 Developed by the team at Ecig Avenue, Avenue E-Liquid is a premium line of new e-juice produced in the USA. Ecig Avenue partnered with Spinfuel Magazine’s award winning JuJu Vapor to create the line, which consists of 15 flavors made-up of 30/70 PG/VG. They offer a couple reasonably complex blends and a few basic, 1-flavor options, available at a full range of nicotine strengths. Lemon Custard, Strawberry Kiwi and Caramel Apple are just a few of the most interesting choices. * This deal expires on March 31st at midnight. Good while supplies last.